I knew the fabric had been sitting in my stash for too long, but I didn't know what to do. I knew the reason why though. It was supposed to make a pretty poncho (cape) which had cute fringes on the edge when I bought it. I thought what I bought was a tweed, but the fabric was actually a knitted fabric. (a great mistake!) aw.. It took me more than 2 months to get over my mistake and I finally had a go this week. Seeing it in the photos right now, the fabric positively looks nothing but a woolen knit (even to me). I must have been too excited about it on the purchase... What kind of love makes me so blind? Thus it has no fringes on it. It's fun to wear, and reasonably warm. I'm happy with the result. This is the end of the story for today! Oh yes, I sewed this short and gray skirt for my wintry wardrobe too. I love this skirt. It is simple, yet simply cute. I was about to sew another pair of jeans with this pale blue denim. However, that night, the idea of blue denim dress with big buttons hit my sleeping brain and I managed to remember it until the next morning. The idea seemed extraordinarily good in THAT dream, but I forgot what was that nice about it or why I thought so, without any trace. The dream left one convinced seamstress without any convincing reason! Anyway, I was too convinced that I was getting a great result while I was sewing it. It was so much fun. I knew I was making fun of myself in that way. perhaps. By the way, I am in love with this comfortable dress and also I think it's quite pretty, did I forget to say? It's getting cooler and cooler day by day in my area. I've made two garments for the season. A shirt was made of slightly shiny satin, silk/cotton blend. I bought this fabric to make an under dress, but it was so pretty and I couldn't use it for hiding under my dress in the end. So I made this shirt. As I'm not a good shirt wearer, I tried to make it like blouse as much as possible. I hid front buttons underneath a front flap, chose a narrow stand collar, and omitted pockets, waist darts and topstitches. I think I can say I did well. I really love this color, and I'd love to wear it often in this autumn. I have been curious about jackets with big silhouette, but never had a chance to try before. When Miho started her shop, the first line-up included this big jacket called Columbo, and I had no way to dismiss it. This is my first tailor-collared jacket sewn by myself, too. 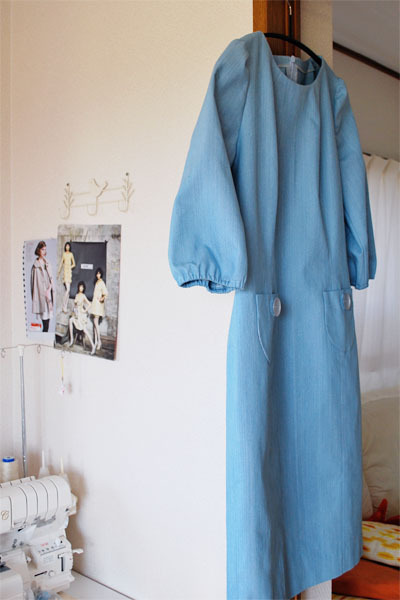 I used this pale gray wool gabardine for making it. When I found this fabric on an online shop, I thought I was really lucky. This is a fabric same as ones for the jackets from Loro Piana, and it was miraculously discounted (because of this funny mice-y color). Hey I don't mind the gray at all! The sewing of this jacket was easier than I had imagined, and I'm enjoying the result! A very big jacket brings my style a fresh breeze and I feel good in it. I love my Columbo! Actually I think the color suits me rather than other deep colors, because I mostly wear pale colors and they match to this gray anyway. *I used a pair of 20mm buttons on the cuffs, instead of using 2 sets of 15mm buttons as said in instruction). The pair of pink buttons was a kind gift from my French friend. Thank you, Helene!! *The corners on cuffs, hem, collar, and lapel were slightly rounded. *I put only left mock pocket on the chest, but omitted the right one. *Invisible hemming was done by hand, instead of straight stitching by sewing machine. I was a bit out of my mind on the other day (the technique that I am most bad at is gathering), and I decided to sew this blouse with much gathering work simply because it looked very pretty and also comfortable. I imagined with stars in my eyes that I could be relaxing myself in it on a cozy weekend's afternoon having a cuppa on the sofa (or something similar). So I took some pictures, and the blouse was abandoned. The story continues. I showed the pics to my friends to prove what I did, and luckily one of them loved it! She finished everything neatly and here she goes! She also sewed a blue dress to wear underneath the blouse. She looks so pretty in it. 34 36 38 40 42 44, I used 36. I don't think so, but it was because I used a very different type of fabric from the one that was used for the sample from Burda. 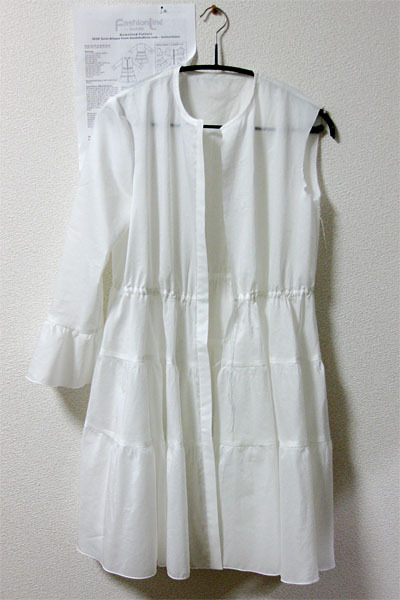 My fabric was rather shirting cotton than transparent flowered chiffon which was in the sample picture. The blouse I made looks bigger with a strong modulation of gathers and ruffles. Yes, I could sew it without a problem. However, I'd be happier if there were pictures to explain. I also thought that one of front bands would be better attached at the last step so that we can check the balance and the length of elastic band at waist with putting it on. I loved the feminine look of the blouse. I have no particular dislikes on it. 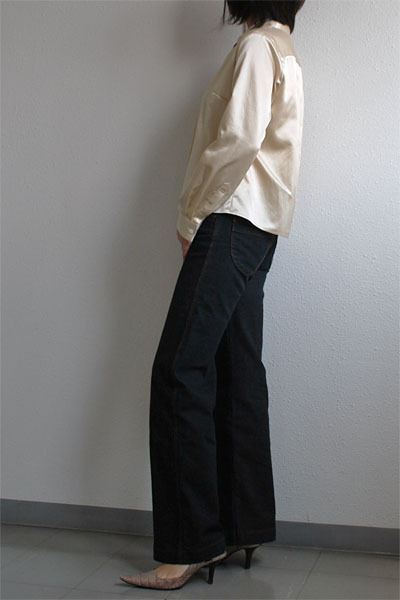 Very thin and light cotton/cupro blend. Slightly sheer. Rather elegant. No, I sewed it without changes. Yes, I will probably sew it again in very soft lacy fabric. I think my version is pretty as it is, but I have to confess I came to know it didn't work on me at all with unknown reason before one of sleeves attached. 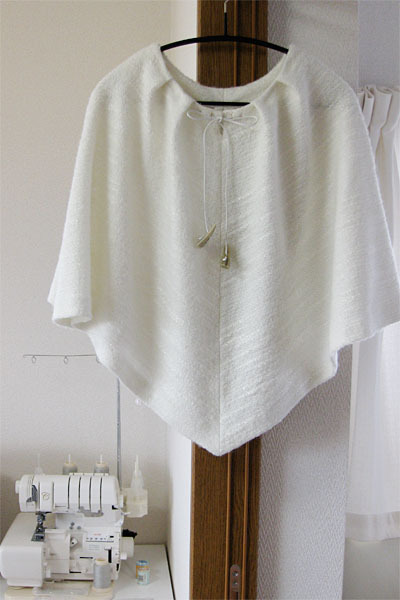 Fortunately, one of my good friends loved it for the first sight and she finished it to get her new favorite blouse. She likes to put it on over a blue light dress that she sewed for the blouse as in the picture. It's very pretty on her! So I recommend it to others even though it didn't work for me, because I know the pattern is right and good. This is a pretty blouse and it look very elaborate. I'm looking forward to the chance to sew it again with the right fabric for me! I think I need the fabric which is flowing and hanging to make its silhouette smaller. How it looks with this pattern is totally depending on fabrics. I'm a skyseeker who sews. MATCHA - what's exciting in Japan? Copyright© 2008 yoshimi the flying squirrel ALL Rights Reserved.